documentation, photos and editorial material. With the latest disaster to hit the US of the catastrophic levels of hurricane Andrew and Mt. St. Helens in the form of hurricane Katrina, lo and behold the criers with their soapboxes come out again. The federal government is at fault, the state is at fault, the mayor, the National Guard, the Sheriff’s Department and on and on and on. We already know that the federal government has room for improvement as far as their uniformity in ability in reacting to the needs of those people victimized by the hurricane. President Bush already admitted his own personal blame in that. Let's not forget to take note though that he also jumped right there tooth and nail, through the various means at hand in the forms of FEMA and the military, when it came time to finally react, and when it really counted. Not perfect performance no, but definitely not total failure either. There 'are' those though, who cannot make that same claim of failure-free duty even if they tried to whitewash it. We also now know that the Governor of Louisiana, Kathleen Blanco, and the mayor of New Orleans, Ray Nagin were at fault for slow response. They both ‘sorta’ got in there and rolled up their sleeves when the long overdue help, rescue and relief criteria demanded action NOW! Yet they expectedly admitted their own individual faults concerning delays and slow reactions also. 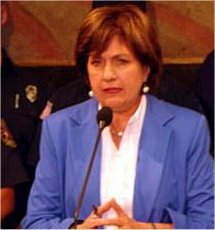 Of course Governor Blanco sort of slithered away from, or rather less it is misunderstood, shrugged off the fact that she met with President Bush on the air field, and refused immediate federal help, action and assistance for preparedness and evacuation efforts. She herself alone was responsible for delaying such efforts for a full 24 hours prior to Katrina. During the Congressional Hearing after Katrina, Former FEMA Director Michael Brown testified to the fact that Governess Blanco and New Orleans Mayor Ray Nagin we at fault for poor response to Katrina. Brown spoke to a special congressional panel led by House Republican leaders to investigate the ineffective response to Hurricane Katrina. He gave witness to the fact that FEMA did its job as was defined per its design. He stated that Blanco herself was at fault for not formally ordering residents to leave the state until the night before the storm. That’s just a documented fact, but such is the art of political passing-the-buck nomenclature. FEMA itself cannot act within any state of the United States without such jurisdiction being giving to it by, guess who, THE GOVENOR OF THAT STATE! The President cannot order FEMA into operational freedom until formal consent to do so is requested by guess who, THE GOVENOR OF THAT STATE! So no one can legitimately, honestly, without bias, claim and blame the death tolls of those drowned, left stranded or who died by other means, upon our President. The delays in relief and rescue had far less ‘fault-impact’ than did the preparedness and evacuation failures so evident in the berth of Louisiana’s politics. BEING REPEATEDLY DUMBFOUNDED IN OFFICE IS! Yet however boring this scenario may already be, we now have to examine and observe Mayor Nagin's performance during Hurricane Katrina's subjecting him to his office's call to duty. When it came time to wait on Govenorness Blanco's tardiness to recede, Mayor Nagin more or less twindled his thumbs along with everyone else all teh way to the State Capitol and seemingly merely sat a'chair. The total confusion so evident when the time to react came, to show preparedness and evacuate with clerity and haste, was so predominately apparent and obvious, people not only stuck in New Orleans afterwards, but as a nation of people as a whole, were totally stunned, and then angry at such stupidity apparent. Leave it to him to ignore media coverage as the fact came out that shortly after Hurricane Katrina, he purchased his family home in none-the-less Huston Texas. Hey! He will at least be safer there, as long as he stays out of office. Texas KNOWS how to do things when the call to duty in the face of calamity hits. That's unmistakenly manifest in their performance of prepartion and policy in the face of Hurricane Rita. Then too, Mayor Nagin’s effort to repopulate New Orleans downtown and business districts after Katrina was over, sort of emphasized his total lack of wisdom and once again exposed his gift packet of ill laid plans and criticism in lieu of Hurricane Rita swinging a roundhouse on his career as mayor. Don't ignore his openly broadcasted enthusiastic advice in prompting people to return to New Orleans, just as people who had aldready become wise to his political jargon heeded their own common sense and accepted the delay to return to their homes or who literally completely turned around once there and evacuated for a short bit again. Then too in his recent comment that in the possible path of Hurricane Wilma, that New Orleans was 'totally' prepared to evacuate using buses and all available transportation infrastructure simply, openly, outstandingly came as a dumbfounded truthful alert. The alert news? Don't listen to Mayor Nagin! We weren’t really surprised with such political hype though, not really. There is always something of a form of slow-headedness there for some reason. I don’t know what good admitting fault by one and all did, nor how we can reach out and spank their hands for being bad. At least they left the door open for change and growth, by declaring openly their fault, and maybe we as Americans can expect changes in the near future before other similar disasters occur. There is always much blame to cast and sling around, no one government nor office can ever perform to perfection. SHOUT AND SCREAM, "OH WOE IS WE!" However in the aftermath and wake of hurricane Katrina and Rita following right afterwards, now we can openly see once again the media parasites coming out of the rotting woodworks. Soap box criers are in ample abundance simply jumping about, pounding podiums and screaming about black racial discrimination. They have seldom ever had such a mouth watering platform to scream out their woes of subjugated horrors since the mid 1900’s till now. “Everyone is taking advantage of the blacks”, “Everyone once again is making the black man wait till last”, “Oh Woe is We”. I get so sick and tired of hearing about those hypocritical b’holes who live off those “Woe is we!” agendas. Why not just start a WIW ("woe is we”) club, and then they can make some of their side-handed funds from club membership and donations to such just purported causes, and let us know who they really are? At least we could distinguish between the faces when they pop up in news articles and be able to identify them with their cause, “Oh, look…another WIW’r!” We of all races of these United States don’t so easily let recognition of the WIW’r club slip by, whenever the media limelight strikes. I myself could not help but notice one dramatic clause to such events. In our current year 2005, there may unfortunately still yet be areas of shameful abuse concerning racial segregation and prejudice out there in our country in certain areas still surviving prior to and including when the 50’s and 60’s horror stories transpired. However, no one in our country can experience as much keen isolation as in the willing, enthusiastic segregation of the black populace by themselves from the Nation’s common people of all races as a whole. Simply claiming racial bias, prejudice and abuse whenever something already drastic and disastrous as Katrina occurs, does not bequeath them the glory due an abused people. Sure there are racial borders in the United States. There always have been and most likely always will be…and INDIVIDUALLY, ethnic communities themselves are probably guiltiest of all for racial separatism in our world today! However, lest we be ignorant of our realities in life, as long as race makes a difference in who someone is and not necessarily merely where we received our cultural qualities, then we ourselves promote racial difference in our own lives. There are the good-and-bad extremes amongst any race, but racial equality is defended and promoted here in the US more than in any other country in the world. Its failure to perfect that claim to an acceptable standard though, does not lay singular blame on the government’s heads of state alone. It’s survival as part of the American way of life lies in the hands of the people themselves, not just in governing bodies. It starts at home and grows in good fashion in the everyday lives of ALL races within the US. You can set laws all the time that protect a person no matter what their race. But if a race of people segregates themselves as a singular ethnic group amongst the many races of the US, then the members that promote their race thus are more to blame than any other. Racial equality has no more power to work successfully in government, than it does to survive and sustain itself within the populace of the American public by our OWN sheer will. If you have 5,000 people including black people, standing on an overpass as Coast Guard and Army Reservist’s helicopters take load after load to safety, bet your bottom dollar that no one will complain the loudest than the more numerous ethnic community, when a family of another ethnic race are air lifted out. Are we to now expect that when a white family, or an Oriental family or Hispanic family were lifted from within the multitude to safe harbor, we won’t hear from the crowd the moronic imbecile complain “They’re leaving us till last!” You also won't hear a poor 'white' family standing there beneath the chop of the rescue helicopter's blades, screaming out, "Hey, take us first, we're WHITE!" You also won't hear whining and complaining, because black people were allowed through lines of masses of people because they were elderly when white elderly were farther back in the line and ignored for the time being. I get so tired of hearing the “Woe is We” clause. Were not white AND black elderly fainting and falling as they stood in line for aid after the hurricane? Did I see any ropes or chairs with signs saying “blacks to the back”? It was so degrading to their ethnic group to watch and listen as people who could really lead in a helpful direction, had to of course claim and include racial segregation as a basis for their motivation. I actually personally saw a middle aged man supporting and steadying an elderly woman who was slowly going to the ground from shear exhaustion while waitin gin line for aid. He was black, and she was white. That was a truer picture of an American willinging helping an American in America during a time of disaster and need, than the criers and wailers and whiners come present during the same time span. Sure, you will read about or see in the news, instances of racial abuse. Those are facts of life in these United States. However, these are singular acts by singular people, their sin and guilt in their own personal expression of racial abuse. It is no different than the reports of police officers looting Walmarts. It isn't the body of the office as a whole that is at guilt, it is that person or small few that abuse and commit the act that are responsible and accountable. Only idiots and morons willing take their soap box to scream out and complain that it is the government as a whole who are at blame. There were no orders issued, no protocols posted, to give true basis to such claims. 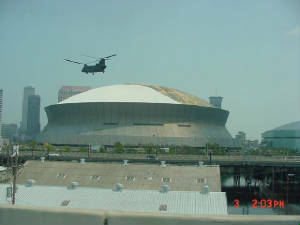 Rumor had it that police and/or reservists soldiers were under orders to shoot any 'black' that tried to leave an overpass there in New Orleans or from the secured areas of the Super Dome. All I can say about anyone stupid enough to believe and spread such a rumor is, you probably deserve the abuse you claim is out there. Singular acts of violence never promoted any such orders ever being given nor would the body of the governing authorities stand still for such 'modus operandi'. That means "a method of procedure or mode of operation", for those highly-educated folks out there that really believe such orders and abuse were actually factual. Again let us look at facts rather than fiction. The poorer poverty level population of New Orleans consists of more black people than any other singular race. Go ahead and complain and use the WIW clause, but it’s a natural fact of the census. It doesn’t mean that the ONLY poor people in New Orleans are black, it merely means what it means, there are more poor blacks that were out there than any other race populace within New Orleans. We saw more black Americans suffering the wrath of Katrina on TV and media sources merely because of that census statistic. The poorer white populace affected by the hurricane was not magically whisked away in covert rescue operations. The Magic Schoolbus didn't make any secret night-time runs to save the poverty level whites, over and above rescue and relief efforts offered to blacks. Now since we got that out of the way, take into affect that it is harder for the lower income and poorer populace to afford means of not only evacuation from the area, but also to expense living quarters and means of menial existence once arriving at a safe evacuation area. Thus once again you have the poorer populace STUCK in a situation with no way out. This is the basic bible of being poor, less choices in life than the more comfortable population of the US, no matter your racial origins. Now again we get to the clearer picture of the scenario, we now have more "poor" people stuck in New Orleans with no way out without the much needed help from local and federal assistance, with nothing included in there differintiating between race. Does this mean that just because there were more poverty level blacks that needed assistance than the other ethnic race groupings, that the governing bodies segregated the needy and surviving populace due to race. Of course not, and all I can say to the racial WIW soap box criers is “Bull!” If these blow horns couldn’t get out there and claim such false origins in their excuse of verbal diarrhea while using WIW policies included as a basis for this nations problems today, well, simply put, they would be out of a job. They wouldn't get the media attention they so desperately need to be in their positions of 'voice authority'. During such times of disaster when conditions become so catastrophically extreme, the last thing we need are WIW ‘screamers’ grabbing their soap boxes and jumping on ‘their piece’ of the bandwagon for their claim to the ‘show and play’. Although their popularity and appeal may be widespread, and although they ‘seemingly’ achieve a common good in their purpose, their modes of operation are as self-serving as a wolf in sheep’s clothing. If the basis for a movement is founded by your racial origin, then you’re not looking at your world as Americans. You are looking at the world through ‘tinted’ glasses, willingly altering the truer view of the problems we suffer as Americans. In view of that fact, let’s review a recent statement concerning the aftermath of hurricane Katrina made by the honorable “Rev.” Jesse Jackson. “Racism is partly to blame for the deadly aftermath of Hurricane Katrina. 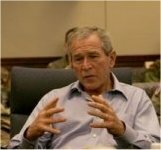 His (President Bush’s) whole response is unacceptable. There's a historical indifference to the pain of poor people and black people in this country. " Jackson also openly questioned Bush’s failure to place blacks in “top positions in the federal response to the disaster, particularly when the majority of victims remaining stranded in New Orleans are black…that represents a kind of incompetence." 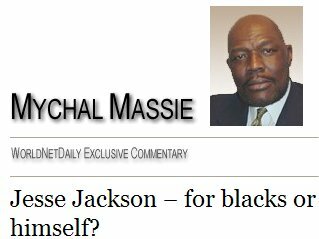 Click on this link to see what truth lays behind Jesse Jackson's claim and psuedo-support for the segrgated black community. Don't miss this article! So its not necessarily new news, to read of another ploy by good ol' Jesse to grab his soapbox and go for the "Oh woe is we" format. In a nut shell, now with Katrina over and done with, and rebuilding continiuously continuing, another disaster has hit close to home. No differences in the way such things are handled, no subjected subject being abused or trampled on, unless you look past the wailers and woe-is-we'rs and see the changes such as FEMA being brought into court for their slow reactions. But don't lose perspective enough to fail to see the screwed up way some humans handle catastrophy. Some set themselves up to act like paranhas and feed off the hardship of others. Some pass the proverbial buck and claim that the lerthargic slow-motion response time or flat out failure to react, was someone elses fault, not theirs. The massed minions sit on their posteriors like they always have and holler about their poor souls and oppressed lives instead of getting off their asses and making their lives better! In all venues, they are always looking for someone else to blame their positions on, someone else to pass the buck too. 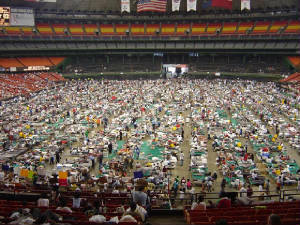 As the Tsunami overseas now also under the belt of this world's poor and afflicted getting trampled on, the response and rescue efforts during Katrina put to shame, other world organization's excuses for their efforts during synchronized emergency response plans. Those rescuers involved in Katrina's aftermath, deserve each one and all, medals of valor and honor. The poor of our nation will always be the down-trodden and the majority in such emergencies. Such has always been the way and the pauper is always the one to get crapped on when it goes to flying around. The politicos out there are the ones who get to enjoy the slinging of it and are the true wolves in sheep's clothing, the ones who profit off the supposedly non-profit efforts they exploit. 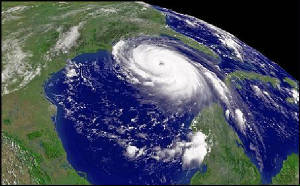 New Orleans and Katrina were no different than any other disaster stricken area. The media hyped the woe-is-we'rs and panned their cameras to any whiner with a good cry story. President Bush laid down a well said message. It isn't the Federal Government's job to come nurse maid your state's population after some unfortunate catasophy. Its the responsibility and jobs of the state leaders to perform the necessary tasks and emergency formats and preparedness that saves lives and helps the needy afflicted. No government is perfect, no plan foolproof, but when I heard that Nagan got re-elected influenced by the shear numbers of the black community, and I really wasn't all that surprised that those huddled masses of the black community were ignorant and uneducated enough to be fooled into electing such a moron back into office. The govvenor was white, and the President too, so the black guy wasn't to blame you see, he's black so he's our hero. So let them grovel when the next hurricane hits New Orleans and the patched up and repaired, not replaced, levees break around their heads again. Let them drown in their own sorrow, for not being the wiser for allowing a fool to guide a ship of fools. They can holler about prejudice and being stepped on , but no one can step on someone more effectively than they themselves. Next time, let the soap box criers and the woe-is-we wailers be forewarned. When you wish to use your freedom of speech as a Constitionally gifted citizen of the United States, do so as an American people, not as an ethnic WIW'r. Protest the lack of effort by those in office as the poor, the down trodden, but not as racially motivated bigots. Complain to the degree of resolve, as one, as a citizen, not as a colored vendetta to overlook your own inequities.